We have several opportunities to help maintain this mountain gem, meet like-minded people, make friends, and help others enjoy this old-fashioned way of wilderness camping. If you can’t volunteer your time but would like to help the camp monetarily then please visit the Donation page. Taking on the role of Camp Host is an overnight commitment, and comes with a free stay in the Manager’s Cabin. The primary concern of the host is welcoming and tending to guests who have booked a cabin, or even the entire camp. Duties include preparing the camp for the arrival of guests, such as starting up refrigerators, turning on heaters and stocking restrooms. The host must make sure that guests are familiar with the layout of the camp, show them around the kitchen, and supply them with BBQs, recreational equipment, etc as necessary. Hosts also tend to housekeeping duties, as well as maintain the electricity and the propane supply. Camp Hosts may also need to act as Camp Docent and perform some of the lighter grounds maintenance duties described below. Orientation for new hosts will cover all of the above plus safety and emergency procedures, radio and crank phone communication with Chantry Flat, and closing procedures. 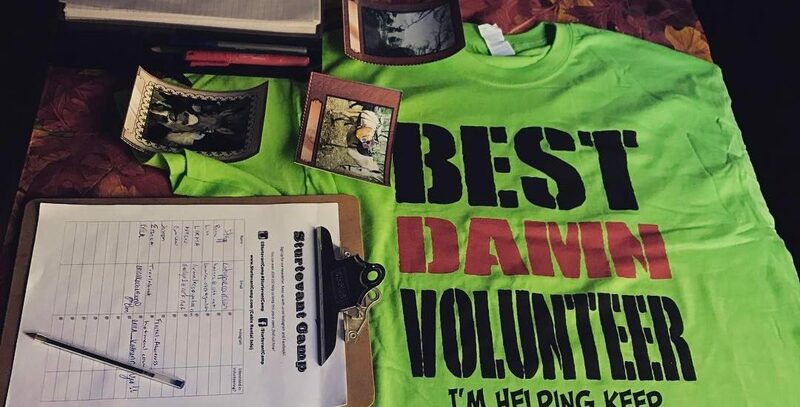 The role of Camp Docent was created when the Sturtevant Conservancy took over management of the camp to allow the Camp Host to tend to overnight guests while the docent greets friends and curious visitors that are passing through. Docents teach the history of Sturtevant Camp to hikers, explain how it got there in the middle of the forest, and generally promote staying at camp. Duties also include supplying visitors with refreshments and maps, possibly some light housekeeping. If docents want to work more than one day then we can arrange for overnight accommodations, most likely in the private room under Sturtevant Lodge, which is not available for guest reservation, close to the creek, and offers a sunny morning ambience. Grounds maintenance is an important and ongoing chore. All of the areas, and pathways between them, need to be kept raked and and swept, cleaned of leaves from Big-Leaf Maples and debris from Big-Cone Douglas Fir. Cobwebs in the eaves of the buildings is also a battle. The Periwinkle ground cover, used to stabilize slopes, needs to be kept from encroaching on pathways and trails. These and other light duties are required to keep the grounds clean and presentable. Heavier grounds maintenance is needed occasionally. Most importantly a proper fire clearance needs to be maintained. Because Sturtevant Camp is situated amongst trees, there is not a lot of weed and Chaparral trimming involved. But dead branches need to be moved and/or collected for firewood, and dead leaves need to be removed from the ground cover. The trail to the helipad also needs to be kept clear and easily traversed. Repairs are needed from time to time, of course, so volunteers are needed for the call list for typical repair work, such as carpentry and plumbing. Larger jobs, such as roofing, are rarely needed. The camp will arrange for any and all tools and supplies needed to be packed in by Adams’ Pack Station. How would you like to help? Choose as many as you like.